Lenze executives Doug Burns and Daniel Repp will highlight, at a packaging show, new software developments that can dramatically reduce machine development time and simplify the programming of motion control and robotic systems. Their presentation at Pack Expo in Las Vegas on September 30 titled “Innovation for Easy Packaging Machine Automation” explores strategies for using automation software tools, which have advanced significantly. 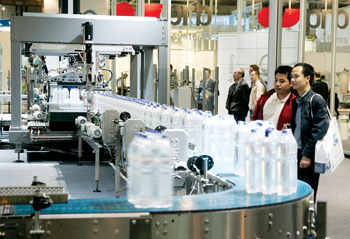 With robots becoming increasingly common in the packaging industry, machine builders face the challenges of integrating their control systems, or individual kinematics, into the entire automation system. The use of standardised, reusable software modules is a straightforward approach to easy configuration of robotic movement and seamless integration with machine control functions. More than 30,000 attendees and 1,800 exhibiting companies are expected to attend Pack Expo Las Vegas 2015, being held September 28-30 at the Las Vegas Convention Centre in Nevada. The world’s largest packaging and processing event in 2015, Pack Expo Las Vegas will bring together decision makers from a wide variety of industries and across the supply chain. Lenze is a global manufacturer of electrical and mechanical drives, motion control and automation technology for Motion Centric Automation. The company’s products can be found in many industries, including automotive, packaging, material handling and logistics, robotics, and commercial equipment (pumps/fans).